On October 17, 1947, a fire started near Newfield. It grew quickly and moved east, destroying Goose Rocks Beach, Fortune's Rock and parts of Cape Porpoise. Thousands of historic buildings perished. 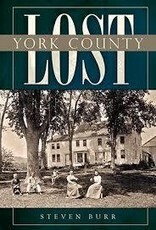 The 1947 blaze was unique in the scope of its devastation, but fire has claimed countless York County landmarks over the years. Development projects, neglect and weather have doomed many more. Lost York County presents rare photos of many of these buildings, preserving the visual record of lost town halls, churches, schools, homes and hotels, from Kittery to Biddeford. In this collection of many never-before-seen images, Steven Burr offers a tribute to places and memories seized by time.